Western blot analysis of extracts from 293 cells, untreated or UV-treated (100 J/m2 followed by 4 hour recovery) using Phospho-SMC1 (Ser360) Antibody (upper) or SMC1 Antibody #4802 (lower). Antibody phospho-specificity was determined by treating cell extracts with λ phosphatase. 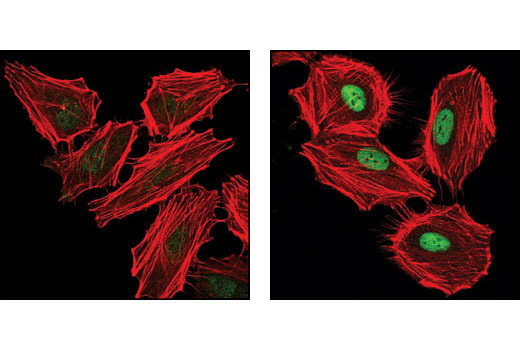 Confocal immunfluorescent analysis of HeLa cells, untreated (left) and UV-treated (right), using Phospho-SMC1 (Ser360) Antibody (green). Actin filaments have been labeled with DY-554 phalloidin (red). 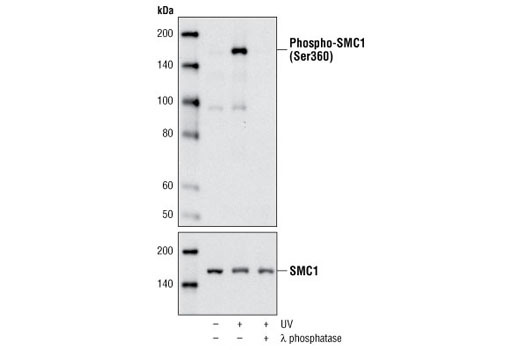 Phospho-SMC1 (Ser360) Antibody detects endogenous levels of SMC1 protein only when phosphorylated on Ser360. This antibody does not cross-react with other SMC proteins. Polyclonal antibodies are produced by immunizing animals with a synthetic phosphopeptide corresponding to Ser360 of the human SMC1 protein. Antibodies are purified by protein A and peptide affinity chromatography. The serine residue at 360 of SMC1 is phosphorylated in an ATM/ATR-dependent manner in response to DNA damage (5,6). Phospho-SMC1 (Ser360) Antibody is directed at a site that was identified at Cell Signaling Technology (CST) using PhosphoScan®, CST's LC-MS/MS platform for modification site discovery. Phosphorylation at Ser360 was discovered using an ATM/ATR substrate antibody and was shown to be induced by UV treatment. Please visit PhosphoSitePlus®, CST's modification site knowledgebase, at www.phosphosite.org for more information.